News From The Hill: Decorations Unpacked!! It's been a fun week with holiday music playing and lots of reminiscing. 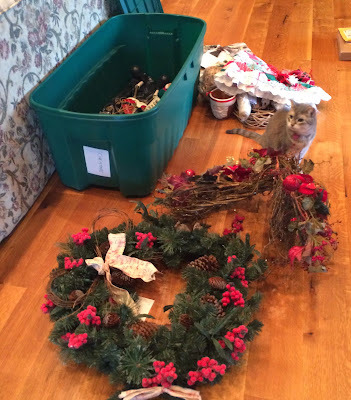 I unpacked our Christmas decorations for the first time in three years! "Help" in the form of a 17 year old Tabby! Noel thinks that since this is her holiday, she needs to be in the thick of it! I had packed the decorations to survive a journey after the Christmas of 2010.
and United Van Lines brought my 10 red and green plastic tubs up here to VA. Despite her age, she plays like a kitten! so I didn't get out a single bit of Christmas that year! Last year "survival" was the name of the game: decorating wasn't in the agenda! I was painting and staining like a madwoman. no paint fumes, leisure time and no sheetrock dust!! and took our time mulling over where best to place each of our holiday trinkets and treasures. the humongous front door needed a new wreath. who knows it might even see some action this year after a 45 year dry spell! I hate to leave you out on the porch, but it's not so bad and we'll step inside tomorrow! Can't wait to see it in person! Noel is so funny. See you soon. I read your comment over at Thistle Cove Farm about Sandra losing her little angel. You and I both said about the same thing so I just had to come over to visit. I'm in Houston, so we were always close. My entire family went to school in Virginia, it's in our hearts, and is a part of the legacy we hope we never abandon. So happy to know you. 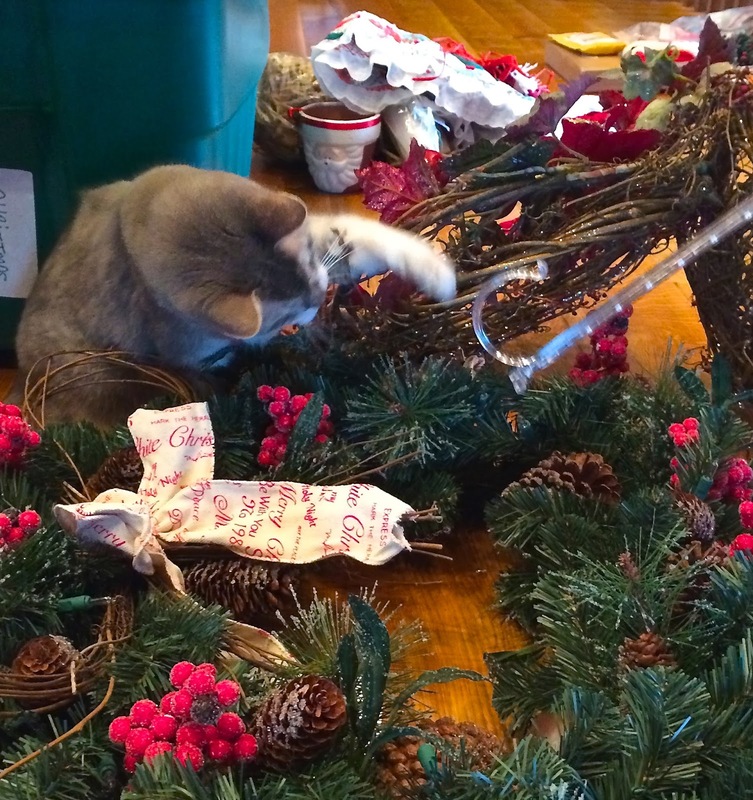 I love that wreath and the fact that your cat gets to help. Yes, I know, the cat is supervising, not helping. We are hoping for snow after the kids get here. And then we will do some sledding! Grace, I know how you feel about unpacking the Christmas decos. We placed ours in the storage unit after last holiday season in hopes the house would be sold by this holiday season. Unfortunately that hasn't happened, so we bought a few "new" ( to us) ones at a couple of local thrift stores. We are will also have fun one day unpacking our holiday reassures in a new setting. By the way, we didn't mind being left on the front porch while you readied the interior.